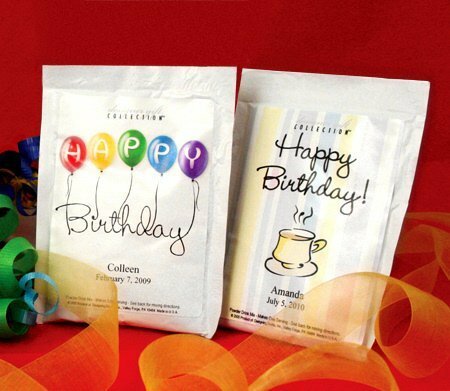 Choose from over 50 different cappuccino birthday favor designs! Give birthday party guests a little token of your appreciation that they can take home and savor. 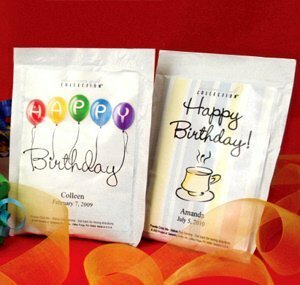 Each single serve packet is personalized with the name of the birthday boy or girl and the date. Cappuccino Packet Info: Each white glossy packet measures about 4" wide x 5.5" tall and holds a single serving (1 oz) of gourmet mocha cappuccino. Packet contents have a shelf life of 1 year and are not kosher.